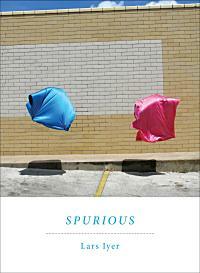 Is anything “real” in Lars Iyer’s Spurious? Is any element of the narrative or environment more than a manifestation of the existential anxieties of the novel’s first-person protagonist, also named Lars, whose cruel and slightly more successful friend W. relentless taunts and berates him, and whose horrible apartment is being slowly overcome by “the damp”? The damp can get no wetter in the kitchen, I tell W. The plaster comes off on my fingernails. It’s brown paste. And the smell, the terrible smell. What’s rotting? What’s behind the kitchen units? It doesn’t matter if anything’s real, really. The novel is addictive and immersive and funny and disturbing and maddeningly repetitive, all at once. For something that reads like the travelogue of a mind (or minds) going in endless circles, it’s fantastically good. There isn’t a plot—Lars and W. talk about philosophy, Canada, Kafka, Judaism, the end of the world, semantics, dampness, and many other things. Every conversation is a small, petty power play. W. has a book published; it doesn’t sound like a very good book. In his relentless meanness, W. comes to seem like the personification of Lars’s self-loathing. Once I lived with a roommate who had some kind of schizophrenic breakdown while we were living together. In the months before that breakdown, he’d pile the kitchen sink with food-covered dishes. If I cleaned and emptied the sink, I’d come home a day later and find it mysteriously refilled. Plates covered in congealed cheese…. gravy everywhere… bits of bad-smelling meat… all of it sitting in stagnant dishwater. So eventually I just stopped cleaning the dishes, and a mold began to grow outward from the sink into the apartment. It crept up the walls toward the ceiling, and down the cabinets toward the floor, and then into the living room. After a while, this sort of thing starts to affect you psychologically. Maybe that was one reason he had the breakdown. Iyer does a good job of capturing that sense of implacable decay and inevitability. The unstoppable damp seems related in some ominously obscure way to Lars’s relationship with W., a relationship that seems based on the slow erosion of Lars’s self-worth and sense of identity. There’s a Beckettian sense of absurdity in the conversations between the two friends, who seem to enjoy believing that humanity is in its last days. At one point, W. becomes fixated on the phrase “vortex of impotence,” which, he meanly asserts, describes Lars’s “entire life: action and powerlessness, movement and paralysis, that strange combination of despair and frenzy.” It describes the novel, too, and not in a bad way. Spurious is the best kind of philosophical novel—the kind that simultaneously engages and drives you crazy as you’re reading it, then stays with you for days after. NICK ANTOSCA is the author of the novels Fires and Midnight Picnic (winner of a 2009 Shirley Jackson award). His fiction and journalism have appeared in n+1, The Paris Review, The Daily Beast, The Huffington Post, Hustler, Nerve, Film Threat, The New York Sun, The Barcelona Review, Bookforum, and Interview.